Loy, a state representative, a state senator, then a county judge, did a lot for Grayson County during the 19 years he was in public service. He came to Denison in 1912 from his Tennessee home and got a job as a brakeman on the Katy; in time, he became a conductor. His time with the railroad was short, but he would show his paidup membership in the Brotherhood of Railway Trainmen at the drop of a hat. In 1919, he worked for a while in the Hays and May Department Store, then at J.W. Madden Company, and dreamed of owning his own business. That didn’t happen; instead he went on the road as a salesman for Pool Manufacturing Company of Sherman. With his eye on state government, he won an election for state representative from Grayson County in 1926 and three years later took a state senate seat, serving one term as President Pro Tem of the Senate. His greatest accomplishment took place during his first year in the legislature, when the public was demanding a free public bridge across Red River, north of Denison. Representative Loy authored and gained support to pass House Bill 379, known as the Free Bridge Law. 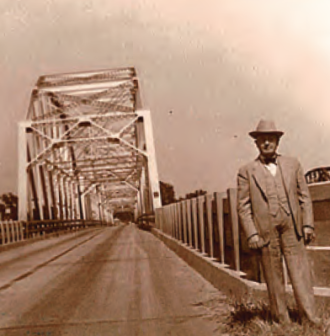 The law made toll bridges illegal in Texas, and in 1931, a new, free bridge spanned the Red River north of Denison. A lawsuit and a federal injunction against the bridge’s opening brought by a private toll bridge owner in Colbert started the infamous Red River Bridge War with Oklahoma. Texas Rangers faced off against Oklahoma National Guardsmen while “Alfalfa Bill” Murray, the Sooner governor, played to the press. The only shots fired, however, were by Texas Rangers doing target practice while waiting for the politicians to sort things out. When the Texas Department of Highways and Public Transportation took down the old bridge to make way for the new concrete span that carries US 75 across the Red, they carefully removed the plaque. It now hangs just inside the Grayson County Frontier Village Museum at Loy Park. After Loy retired from the Texas Senate, the folks at home elected him to be County Judge of Grayson County, an office he held until his death, July 4, 1945. Seven times he ran for county judge, and seven times the voters gave him the nod. A park where children and teenagers could go for recreation was a seed that took root in his mind when he presided over juvenile court and saw that there was no such place for youngsters. 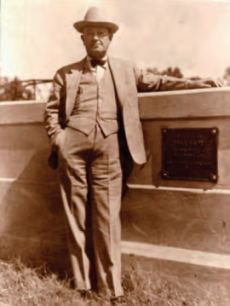 He led the county effort to buy acreage southwest of Denison, where a Civilian Conservation Corps established a camp and built a dam to form a 56-acre lake along with a beach, roads, and a concession stand. No one seriously considered naming Loy Park anything else. It would just not have been right. As the county’s chief booster, Judge Loy joined with Congressman Sam Rayburn from Bonham to secure federal support for the Denison Dam, and as war closed in on America, he convinced the U.S. Army Air Corps to bring a basic flying school to Grayson County. Perrin Field served the air force through three wars and is now the Grayson County Airport. Although he died long before Tommy Loy’s haunting solo trumpet rendition of “The Star-Spangled Banner” became an NFL tradition at Dallas Cowboys home games, Judge Loy had a hand in guiding his nephew into a music field rather than onto the football field. When young Tommy could not decide whether to play football or follow a music career, the judge gave him an Encyclopedia of Music, hoping to keep him out of harm’s way. Tommy took the hint, choosing to play “at” rather than “in” the games, and had a great music career. The judge laughed and said he wasn’t even sure himself what he was doing in there. But the people of Grayson County knew what he was doing. He was doing what he did best—strengthening the foundation of his county for the future that we are enjoying today. Photos for this story were provided courtesy of the Grayson County Frontier Village. The Frontier Village Museum is a collection of 19 rustic buildings dating from 1840 to 1900, all restored and furnished. Exhibits include household utensils, crystal, pioneer clothing, and tools. The Village is on 17 acres in Loy Park, Exit 67 off U.S. 75 Frontage-Loy Lake Road, Denison. Open during the summer Wed. through Sat. 1-5 p.m. Admission $2.00 adults, 50-cents children under 12. A family of two adults and any numbver of children under 12, $5.00. For information call (903) 463-2487. This article appeared in the Summer 2007 issue of Texoma Living!